September is now in the books. 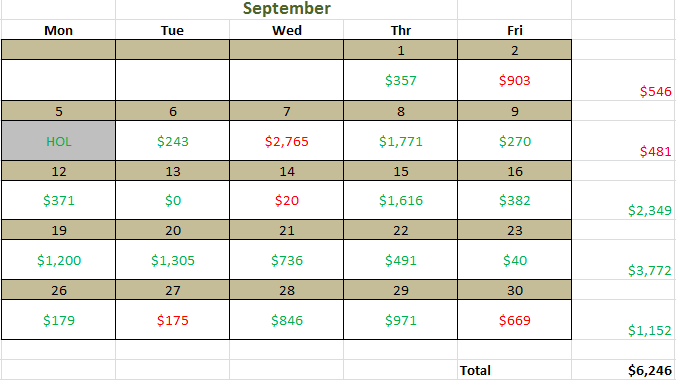 I am closing September up $6,246! That is my best month yet, since starting to trade full time at the beginning of this year. My average green day was $719, average red day was -$906, and daily average of $312. I had just 5 red days. 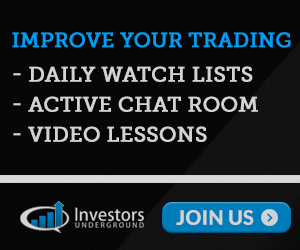 What I did right: I had good consistency this month and controlled my losses. For the most part I controlled my losses and worked on preventing stubborn holds. I worked on adding to my winners which helped increase profits (though I still have a lot of work to do in that area). I also tried to keep on a piece of a position for further downside. I did a good job at taking better position sizes relative to the range of the stock. What I did wrong: I have a tendency to let my P&L influence my decision making. It can be hard for me a times to hold a position longer when I am green and it starts to move against me. I did have one stubborn hold this month on RGSE which was unacceptable. I did really well with being patient on my entries all month except for the last week. This caused some headaches. Goals for October: I really want to focus on scaling into my winners. I am having great consistency, but I need to work on making those wins bigger through proper scaling. Patients on my entries is going to also be a focus of mine this month. And lastly, I want to end October being able to say that I did not brake any of my rules through stubbornness. I am excited for October. I am hoping for another record month!